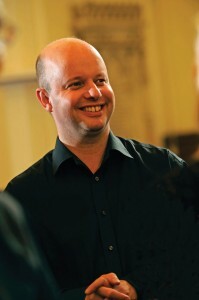 David Ogden (b.1966) is a professional conductor and composer based in Bristol. He conducts Exultate Singers, City of Bristol Choir, the Bristol Youth Choir, the RSCM Chamber Choir, the Royal Mail Choir and three choirs at Merchants’ Academy in Withywood. He is Director of Music at Holy Trinity Church, Westbury-on-Trym in Bristol where he conducts three choirs as part of the church’s active music programme. For nearly thirty years he has worked around the UK and abroad with numerous professional and amateur groups of all shapes and sizes in many fields of music making, including church music, concerts, musical theatre and opera, community projects, primary and secondary level educational workshops, from small children’s groups to the City of Birmingham Symphony Orchestra. He has conducted over 100 large scale choral works including first performances of pieces by Shostakovich, Roxanna Panufnik, Francis Grier, Thomas Hewitt Jones and James Whitbourn. He has made fifteen CD recordings and directed choirs in numerous cathedrals, churches and concert halls in twelve European countries and in the USA, Philippines and South Korea. In the UK, he has worked extensively with the Royal School of Church Music, and with the BBC, conducting choirs on BBC Television and on Radios 1, 2, 3, 4, 5 and the World Service. For twenty years he has worked as a conductor, arranger and music adviser on BBC TV’s Songs of Praise. He has been Religious Music Adviser for the BBC’s hit series Call The Midwife since its inception and worked with the Royal Mail Choir in the BBC Two series The Choir: Sing While You Work. David conducted the choir for a charity single with X-Factor winner Joe McElderry in 2013 and on the 2013 Royal Mail Christmas TV advertisement. In 2014 the choir raised over £50,000 for Prostate Cancer UK. His compositions are published by the RSCM and White Light Publishing, and are performed in schools and churches worldwide and broadcast frequently on BBC radio and television. In Bristol he has written songs and directed choirs for the opening of Cabot Circus, the M Shed museum, BBC Food and Farming Awards, and the refurbishment of Bristol Old Vic Theatre. In April 2008 one of his anthems was performed by a 250-strong choir in the presence of Pope Benedict XVI as part of a Papal Mass in Washington Nationals Baseball Stadium in Washington DC with a congregation of 40,000 people in attendance. In 2015 David was made a Fellow of the Royal School of Church Music in recognition of his services to church music both in this country and internationally.